This post will focus on “how to measure inventory performance with analysis, why the analysis are important, How to calculate, what the formula is and what things you should note when you analyze on each“. 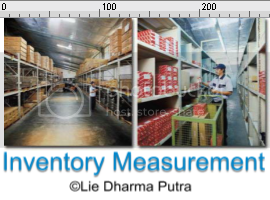 There are actually 32 common analysis/measuerements for inventory control purpose, but I will post four of them at first, they are: Inventory Accuracy, Inventory Turnover, Inventory Availability and Storage Cost per Item. If a company’s inventory records are inaccurate, timely production of its products becomes a near impossibility. For example, if a key part is not located at the spot in the warehouse where its record indicates it should be, or its indicated quantity is incorrect, then the materials handling staff must frantically search for it and probably issue a rush order to a supplier for more of it, while the production line remains idle, waiting for the key raw materials. To avoid this problem: a company must ensure that not only the quantity and location of a raw material is correct, but also that its units of measure and part number are accurate. If any of these four items are wrong, there is a strong chance that the production process will be negatively impacted. Thus, inventory accuracy is one of the most important materials handling measurements. Divide the number of accurate test items sampled by the total number of items sampled. The definition of an accurate test item is one whose actual quantity, unit Inventory of measure, description, and location match those indicated in the warehouse records. If any one of these items is incorrect, then the test item should be considered inaccurate. It is extremely important to conduct this measurement using all four of the criteria noted in the formula derivation. The quantity, unit of measure, description, and location must match the inventory record. If this is not the case, then the reason for using it—ensuring that the correct amount of inventory is on hand for production needs—will be invalidated. For example, even if the inventory is available in the correct quantity, if its location code is wrong, then no one can find it in order to use it in the production process. Similarly, the quantity recorded may exactly match the amount located in the warehouse, but this will still lead to an incorrect quantity if the unit of measure in the inventory record is something different, such as dozens instead of each. Inventory is often the largest component of a company’s working capital; in such situations, if inventory is not being used by operations at a reasonable pace, then a company has invested a large part of its cash in an asset that may be difficult to liquidate in short order. Accordingly, keeping close track of the rate of inventory turnover is a significant function of management. Turnover should be tracked on a trend line in order to see if there are gradual reductions in the rate of turnover, which can indicate that corrective action is required to eliminate excess inventory stocks. The most simple turnover calculation is to divide the period-end inventory into the annualized cost of sales. One can also use an average inventory figure in the denominator, which avoids sudden changes in the inventory level that are likely to occur on any specific period-end date. A variation on the preceding formula is to divide it into 365 days, which yields the number of days of inventory on hand. This may be more understandable to the layperson; for example, 43 days of inventory is more clear than 8.5 inventory turns, even though they represent the same situation. The preceding formula does not yield as clean a relationship between direct materials expense and work-in-process or finished goods, because these two categories of inventory also include cost allocations for direct labor and overhead. However, if these added costs can be stripped out of the work-in-process and finished goods valuations, then there are reasonable grounds for comparing them to the direct materials expense as a valid ratio. The turnover ratio can be skewed by changes in the underlying costing methods used to allocate direct labor and especially overhead cost pools to the inventory. For example, if additional categories of costs are added to the overhead cost pool, then the allocation to inventory will increase, which will reduce the reported level of inventory turnover—even though the turnover level under the original calculation method has not changed at all. The problem can also arise if the method of allocating costs is changed; for example, it may be shifted from an allocation based on labor hours worked to one based on machine hours worked, which can alter the total amount of overhead costs assigned to inventory. The problem can also arise if the inventory valuation is based on standard costs and the underlying standards are altered. In all three cases, the amount of inventory on hand has not changed, but the costing systems used have altered the reported level of inventory costs, which impacts the reported level of turnover. A separate issue is that the basic inventory turnover figure may not be sufficient evidence of exactly where an inventory overage problem may lie. Accordingly, one can subdivide the measurement, so that there are separate calculations for raw materials, work-in-process, and finished goods (and perhaps be subdivided further by location). This approach allows for more precise management of inventory related problems. One of the primary reasons for having inventory is to satisfy customer demand in a timely manner. Maintaining a high level of inventory availability is usually cited as the primary reason why companies keep such high levels of finished goods and service parts on hand. Given this logic, one should measure a company’s success in filling orders to see if high inventory retention is working as a policy. To measure inventory availability, divide the total number of completed orders received by customers no later than their required date during the measurement period by the total number of completed orders that customers should have received during the measurement period. The measurement emphasizes a successful order fulfillment as one received by the customer on time, because the customer is not being served properly if the order was merely shipped as of the required due date. Most company systems have no provision for tracking customer receipt dates. To avoid this problem, a company can train the order entry staff to subtract shipping time from a customer’s required date on receipt of the order, and enter the shortened date in the order entry system. A company can falsely assume that it has a high availability rate if it counts any sort of partial shipment as a completed order in the numerator, possibly on the grounds that it has successfully shipped nearly all of an order. This measurement approach certainly is not the view of the customer, who may well stop using the company on the basis of a “completed” order, which it sees as a failure. Inventory items can languish in the warehouse for years. During that time, one can forget their presence on the assumption that they are accumulating no costs and so can be safely ignored. Unfortunately, inventory accumulates more costs every day in the form of rack space taken, insurance coverage expenses, the opportunity cost of invested funds, and so on. One must be aware of these costs or be ignorant of a major portion of a company’s cost structure. The problem with this calculation is that not all SKUs incur the same costs. For example, a high-value item should be charged a higher proportion of insurance costs, whereas perishable goods must be charged with a higher proportion of obsolescence costs. Thus, a better approach is to adopt an activity-based costing (ABC) approach to measuring the storage cost per item. Under ABC, costs are accumulated by activity (such as by put away or picking transaction), and then costs are charged out to individual SKUs based on their use of these transactions. Although the ABC calculation can be lengthy, a typical finding is that a large proportion of all SKUs on hand are costing a company far more than they earn on the gross margin from their eventual sale.